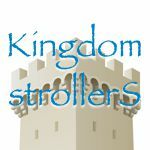 Email [email protected] if you would like to have your work spotlighted. 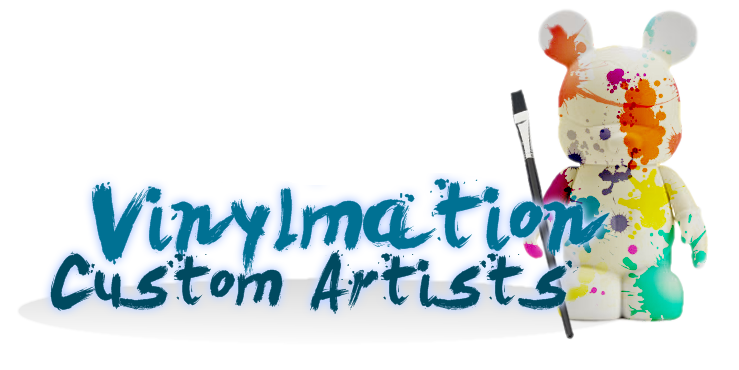 Destination Vinylmation: As an artist, what drew you to the medium of Vinylmation? Brian Shapiro: I’ve been doing film making as a hobby since I was 10 years old. I especially love animation, and I began creating clay animated films on super 8mm film when I was in elementary school. Years later, after I got my first PC computer, I started creating animated films using Flash. 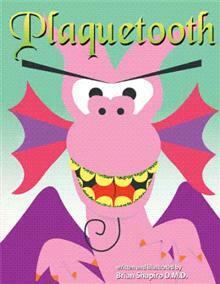 I even used Flash to produce an illustrated children’s picture book called Plaquetooth (www.plaquetooth.com) in 2008. It was during a trip to Walt Disney World in May of 2009 that I was introduced to Vinylmation. In planning my trip online, I had stumbled upon an image of the Park Series #1 Kermit, and I was so intrigued at how a figure shaped like Mickey Mouse had been painted to look like Kermit the Frog! When I arrived at the parks, Park Series #2 had just been released, and I purchased my first figures. I was immediately hooked as a collector. 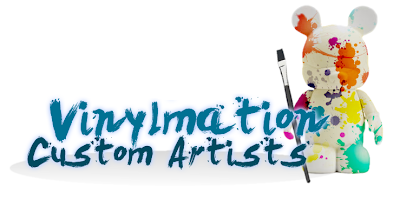 The idea of creating a custom immediately interested me, because it appealed to both my love of creating clay sculptures and illustrating. My first custom was of a soccer player that I used as a cake topper for my daughter’s birthday cake. It was a lot of fun to create, and when I posted images of it online, I received a lot of great feedback. It wasn’t long after that I started making more and more customs. Creating customs is a fun challenge because it’s a combination of art and puzzle solving. The trick is coming up with a concept and then adapting it to a three dimensional canvas that often has inconvenient contours! DV: I hear a lot of collectors looking for a Partners Statue Vinylmation set. You have designed a great looking custom 9″/3″ version. What was the biggest challenge in creating this set? Brian: When I create a custom, I do a lot of planning by sketching the design on the blank Vinylmation template provided on the official site. I then sketch my finished design on a blank create-your-own figure and paint in the details with various solid colors. If I make a mistake, I can always correct it by painting over it with the intended solid color. With the Partners set, I first had to give the figures a faux bronze finish by dry brushing them with many layers of metallic paints. This prevented me from being able to sketch the design for the rest of the details on the figures. I had to paint all the facial and outfit details by freehand with just my template sketches as a reference. There was little room for error, because if I made a mistake, I would have had to go back and dry brush back in the bronze texture and start all over. Also, painting cartoon characters is not too hard because there are a lot of references out there to draw from, but creating a caricature of Walt as he appears in the actual statue took a lot of practice on paper. To complicate things, the nine-inch Vinylmation figure has a very small lower face. The distance between the nose and chin is relatively smaller than it is on the three-inch figure, and Walt had a lot of distinctive features like his mustache and smile that had to be squeezed into that space. DV: You created a Judge Doom with a ton of special details. Tell us about his different features and was the idea always to give him the extras, or did that develop while you were making him? Brian: I’m a huge Who Framed Roger Rabbit? fan, and I think Judge Doom is one of the best and one of the most frightening Disney Villains. Unfortunately, it’s impossible to find any good Judge Doom merchandise, so I decided to create a custom inspired by him. By the time I decided to create him, I had a lot of experience making accessories for my figures using dental acrylic. Dental acrylic is great because it is lightweight and strong, and it can be fashioned into any shape. 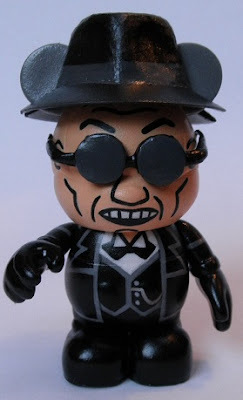 Until Judge Doom, I had used the acrylic to make hats, but fans of Who Framed Roger Rabbit? know that Judge Doom had more than just a hat. In the movie he had sunglasses to mask his sinister red eyes, and because he was actually a toon (spoiler alert! lol), his hand transformed into an anvil and a rotating saw at the end of the film. From the start I thought it would be cool to create the figure to resemble the character in the early part of the film, and then with the removal of the hat and glasses, it would look as he did at the end. I also wanted the figure to be able to switch between the anvil and the saw without having to pull its entire arm off to make the change. When you create a crown for a tooth, you shave the tooth into a peg-like shape with minimally tapered walls to allow the crown to fit over the tooth. 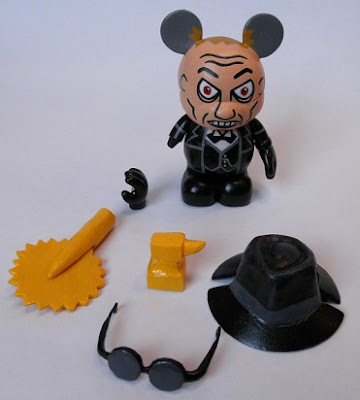 I used the same principle to shave the right hand of the blank Vinylmation figure into the identical shape I would give a tooth for a crown. I then created the anvil and a spinning saw to fit over the peg-shaped hand. Using an impression of the original hand, I created an acrylic copy of it to fit over the peg shape so it would look like an unaltered figure when I wanted it to. When the figure was complete, I thought it would be amusing to create a stop motion animation of him using the interchangeable parts and the soundtrack from the film. I’m really happy about how he came out, and he looks great on display with my custom Jessica Rabbit. DV: Do you do commissioned pieces? Brian: I am open to doing commissioned pieces when time allows. Most have been original designs like custom tombstones with humorous epitaphs similar to the ones around the Haunted Mansion. I’ve also done some work for the Central Jersey Disney Pin Traders, and I recently did a set of wedding cake toppers. A custom Tombstone that I made for Evilos’ Blind Bag Series 2. Note the feet were flocked to have simulated rocks and turf. DV: Do you have a website where people can view your work? DV: I have been following your work for a long time now. I am so glad we finally connected and were able to showcase your talents. Brian: I really appreciate your interest in showcasing my work!! These are great. I love Doom’s accessories and the painting on the Partners is great.